Templates are sms messages that you have saved to reuse again. To create a template follow these steps. 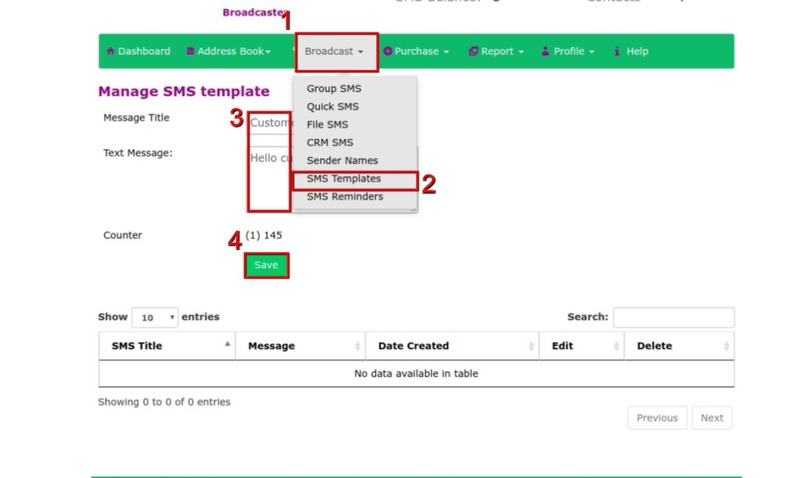 To create SMS templates, follow the steps below. Choose “SMS Template” in the drop down menu. Fill the boxes with the required information firstly, add your Message Title in the provided box, next, add your Text Message (Counter below the box will alert you on the maximum number of words the message can accommodate). The character count will show your how many characters are left per sms and if you have crossed into multiple sms. Note each sms is 160 characters for the 1st sms and 153 characters if longer than 1 sms. You message template will be created and saved with your other entries for future use as shown below.